Lose a lot of hooks? I actually lose my fair share getting caught up in the rocks going after smallies. Well, I found this deal today...to celebrate their 50th anniversary, Tru-Turn is giving away hooks! 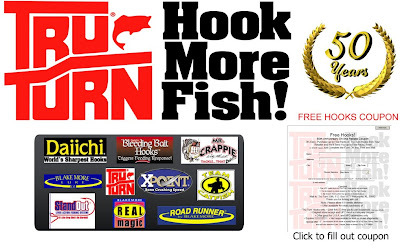 All you need to do is buy (up to 5) packs of Tru-Turn hooks, fill out a rebate form and send in your UPCs and sales receipt, and they'll send you back an equal amount of hooks back for free - that's a $10 value. Honestly, that's a pretty good way to stock up. And don't worry, you've got some time, the offer doesn't expire until 6/30/2011. Thanks for the link, Michael. In today's world, you have to take advantage of any good deal you come across.